There are a lot of things in life that I am unsure about. Like where am I going to live in the next 5 years? Or do I actually enjoy mushrooms or do I just tolerate them? But there are also a handful of things in life that I am absolutely sure about. I want to live within a 7 hours drive from my family. And that Reuben is my soulmate because he tolerates my craziness and loves all the same foods that I do. AND my favorite food group is instant ramen and I could probably eat it every day for the rest of my life if I was forced to choose one thing and if sodium intake didn't really matter. I just love it so much!! I'm going to let you in on a little secret... I actually prefer instant ramen to real ramen. (GASP) Ah, I'm sorry! That makes me such a terrible foodie, right??? It's true though. I'm honestly not a fan of the really rich porky broths. It's a little too much for me. I've had ramen in a milky chicken broth and I was all about it! But a cheap 50 cent package of beef flavored ramen will always be my go-to if I need a quick and satisfying meal. There was an intern at my office last Fall, who only ate instant ramen (oriental flavor… whatever that means!) and canned tuna on crackers for lunch. Every day. As much as her lack of vegetable intake concerned my internal grandma, I respected her lunch choices. I wish I had the courage to bring instant ramen in for lunch! But I’m pretty sure I would get judged hard by my coworkers and I’m also pretty sure I should eat more vegetables during the day. I guess this recipe is a happy hybrid of that though! Pasta salad is my favorite type of salad because of the pasta, obviously. I like it heavy on the carbs. Light on the dressing. And the brighter the vegetables the better! I actually had ramen pasta salad before at a high school graduation party many many years ago. It was AWFUL. I remember being so excited that it existed and feeling so disappointed when I tasted it. The veggies and noodles were mushy and the dressing was so acidic it hurt. So disappointing. I’ve blocked it from my memory until now. This pasta salad is the opposite of that dreaded Midwestern graduation pasta salad. 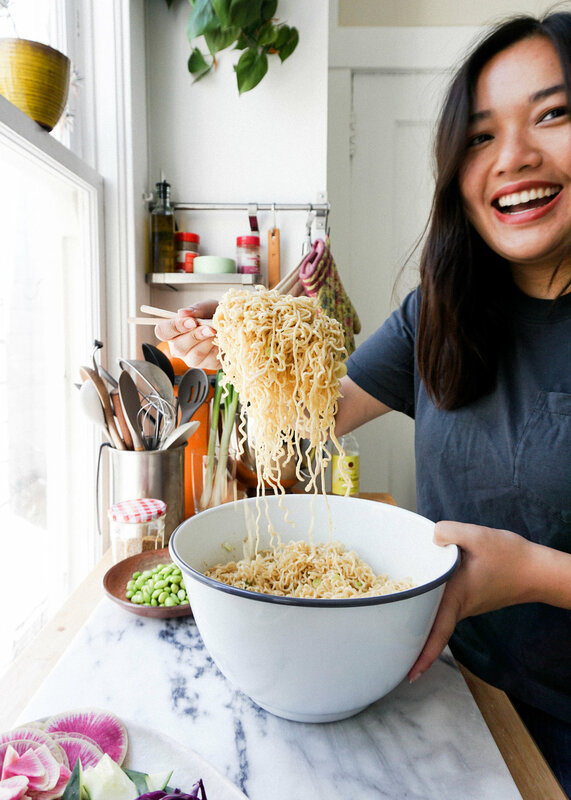 The noodles are perfectly al dente, the dressing is something you will want to put on everything, and it’s full of the prettiest and freshest vegetables you can get your hands on. I used edamame, which you can pick up from the frozen section all year long, my beloved green onions, purple cabbage, and beautiful watermelon radishes. You could use regular radishes, but the watermelon radishes really jazz up the pasta salad and make it look like confetti! Whenever I find them at the store I pick one up to add a little hot pink to my avocado toast or the occasional salad. The beauty of this recipe, and all pasta salads really, is that it can be made in advance and it tastes better and better the longer it sits. Instant Ramen Pasta Salad is particularly quick to make because well, it’s instant! PS. Should I change the name of this recipe to Instant Ramen Salad or keep it as Instant Ramen Pasta Salad? Tell me what to do! 1. Bring a big pot of water to a boil. Place instant ramen noodles in the boiling water and boil or 2 minutes until the noodles are al dente. Remove noodles from hot water and immediately rinse with cold water. Drain noodles and set aside noodles in the fridge to chill. 2. Prepare all your veggies. Thinly slice a watermelon radish other on a mandolin or with a super sharp knife. Cut the cucumber into bite sized pieces. Thinly slice the purple cabbage and chop the green onion stalks. Set veggies aside. 3. Prepare your dressing by placing all the dressing ingredients in a food processor and blend for about 1 minute. If you don't have a food processor you can whisk all the liquids and seasoning together and grate in the ginger and garlic. 4. Take the noodles out of the fridge and toss the noodles with dressing so that everything is evenly coated. Mix in your veggies and enjoy! * Salad can be made the day before and kept in the fridge for up to 4 days. It is no secret that I LOVE my neighborhood. Inner Richmond is by far the best neighborhood in San Francisco. I'll debate you if you disagree. I've been planning a whole post, more like love letter, to Inner Richmond, which will come out eventually! However, I will admit that there could be some improvements. I wonder if there is a community board or council I could join. Issue #1 is the poor access to cheese. This neighborhood is predominately Asian, and Asian people have a precedent of not liking cheese. That's fine. But would it be soooooo terrible for us to get one (just one!) cheese shop?! For the Asian girl that loves cheese?! I just need a place where I can pick up some fresh mozzarella, gouda, a nice parmesan, how about some shredded cheddar?! How is ChoCheeseBoards going to take off without proper access to cheese?! Issue #2 is that the only Non-Asian grocery store in the Clement St. corridor is Smart and Final, which has a weird assortment of goods and items typically come in bulk. No, I don't need a 5 pound package of ground beef or a gallon tub of cream cheese (debatable). I'm also ignoring that there is a Safeway about a 20 minute walk away... too far. Can we get a Trader Joe's at 9th and Clement, please????! So, when I decided that I was going to make this pilaf dish for a dinner party on Sunday, I found myself in a pickle. Where is the basmati rice?! I was sure that they would sell it at our go-to Asian store. Nope. I almost bought this bag described as "extra fancy white long grain rice". What does that even mean??? Extra Fancy? What is just plain fancy rice? I recruited Reuben to help me on Mission Basmati. We needed to be in Oakland in 3 hours. We went back to Smart and Final to take another look at their very limited grain aisle. There was a 20lb bag of basmati rice and we decided to just buy it. It's a big bag. I currently don't have a clever storage solution for it so it's just sitting on the floor of our kitchen, saying "I'm going to be here for a while". We are going to be eating basmati rice for a very long time... eh, it's not the worst thing. It's delicious and technically a lot healthier for you than the jasmine rice that I typically make. I ended up doubling this recipe for the dinner party. 2 cups of rice turns into A LOT of rice here. We were able to make a giant platter of pilaf to safely transport to Oakland and still save some leftovers to have for work lunches. I recently was asked by a friend if I could make more recipes that one could easily make for work lunches. You ask and I will deliver! This pilaf works as a beautiful offering for a potluck or a yummy dish to meal prep on Sunday and enjoy all week. It's easy to throw together, filling, satisfying, and won't leave you battling a serious food coma at your desk. The colors of the rice, carrots, and cauliflower are just so gorgeous together. If you see some rainbow carrots at your farmer's market, BUY 'EM. The carrots are sweet like candy, tossed with honey, brown sugar, cinnamon, and a little sumac. It acts as a sweet balance to the spicy earthy flavors of the cauliflower, seasoned with turmeric, garam masala, and cumin. I make this yogurt sauce about once a week, it's so good and works as a creamy refreshing binder to hold the whole dish together. Cooking is about balance. Once you hit salty, sweet, spicy, sour, you got yourself a great plate of food! If you guys have any requests for what you'd like to see more of on EatChoFood, please let me know in the comments! 1. Start by making your rice pilaf. Add chicken stock, turmeric powder, garlic powder, salt, and black pepper to a pot. Mix to combine and bring to a boil. Add rice and orzo to the stock and lower heat to a simmer. Cover with a lid and allow to simmer for 20 mins. Remove pot from heat and allow to sit covered for another 10 mins. Fluff with a fork, mix in parsley, and set aside. 2. Preheat oven to 400 degrees. 3. Peel the carrots and cut into 1/2" thick slices at an angle. Toss carrot slices in a medium bowl with a heavy drizzle of olive oil, honey, brown sugar, cinnamon, sumac, and a generous seasoning of salt and pepper. Arrange carrot slices on half of a foil lined baking sheet. 4. Cut the cauliflower into medium sized pieces, about 1/2" thick floret slices. Toss cauliflower in a medium bowl with a heavy drizzle of olive oil, turmeric, garam masala, cumin, and a generous seasoning of salt and pepper. Arrange cauliflower on the other half of the baking tray. 5. Make sure the vegetables are in a single layer for optimal roasting! Roast in the oven for 25-30 minutes, until tender and getting slightly crispy on the edges. 6. Make the lemon yogurt sauce by mixing greek yogurt, water, lemon juice, salt, pepper, and sumac. Adjust thickness by adding more or less water or yogurt. 7. Assembly the pilaf by adding a big scoop of rice to a plate or bowl, top with spiced vegetables, and then drizzle the lemon yogurt sauce over it. You could also make one big platter of this to share!